‘It is all history now – ancient history. 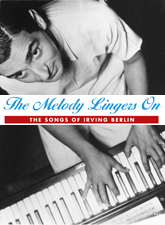 The celebrated romance of the Catholic golden girl, born to millions, and the immigrant cantor’s son from the Lower East Side.’ So writes Mary Ellin Barrett in her biography Irving Berlin: A Daughter’s Memoir, on which this biographical revue is based. In a life that spanned more than 100 years, and with a creative output of over 1,000 songs, Irving Berlin epitomized Jerome Kern’s famous adage that ‘Irving Berlin has no place in American music. He is American music.’ Over a period of five decades, Berlin’s outpouring of ballads, dance numbers, novelty tunes and love songs defined American popular music. This revue was developed at the distinguished Trinity School in New York City and introduced hundreds of high school kids to the work of a man whose name was only familiar to some as the composer of ‘God Bless America.’ As this new generation learned the story of the Russian Immigrant who started as a singing waiter at a saloon on the Bowery, they became increasingly exhilarated with the discovery of each new song. They also found in Berlin’s marriage a compelling, contemporary love story. From Tin Pan Alley to Broadway, from Hollywood to tours of duty throughout Europe and the Pacific, the story of Irving Berlin is the story of this American century. A Singing-dancing ensemble may be incorporated as desired; while the premiere production featured a cast of more than 70, a subsequent production with a cast of only 10 was no less effective. Mark - Consistently plays the role of Irving Berlin, among others. Juliet - Consistently plays the role of Ellin Mackay, among others.